Feeling the post Glastonbury blues? Head over to the Hilton Park Lane for a rock n' rolling time! 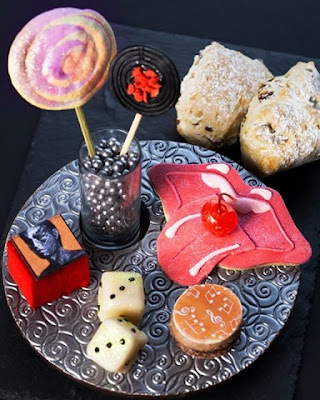 Paying homage to the rock legends, the Rolling Scones afternoon tea is inspired by bestselling albums, songs and other iconic symbols associated with the band, such as the worldfamous tongue and lips design logo. As well as being regular guests at London Hilton on Park Lane, Keith Richards, founding member of The Rolling Stones, is also reported to have written the famous riff from Satisfaction at the hotel. To satisfy diners' taste buds, music-themed treats come served on an edible chocolate plate and include cherry flavoured biscuit lips; a 1978-inspired rainbow lolly; chocolate button cake; cheesecake with a tattoo twist; and tumbling dice based on the band's top 10 hit. Guests will also enjoy a selection of open sandwiches and themed cupcakes, including chocolate swagger space cake, lemon and sherbet popping cake, finger-licking sticky toffee and rockin' raspberry cake. 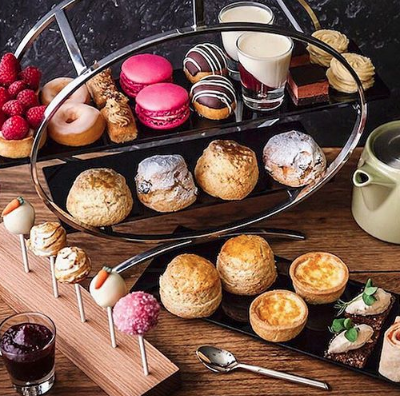 A choice of loose leaf teas and plain or fruit scones will also feature on the menu, with an array of condiments such as chocolate satisfaction, Stone strawberry jam and clotted cream. The Rolling Scones afternoon tea will be available from 1 - 14 July, priced at £29.50 per person. So what do you think? We love the tattoo cheesecake. Let us know your thoughts below!